^ New Orleans a 'ghost town' after thousands flee Gustav: mayor Archived 2013年5月16日, at the Wayback Machine. August 31, 2008. ^ Baker, Lea Flowers. “Louisiana Purchase”. Encyclopedia of Arkansas History & Culture. http://encyclopediaofarkansas.net/encyclopedia/entry-detail.aspx?entryID=2383 2010年9月18日閲覧。. 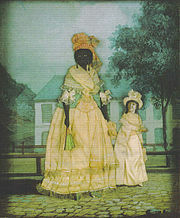 ^ a b c The Slave Trade: The Story of the Atlantic Slave Trade, 1440–1870 by Hugh Thomas. 1997: Simon and Schuster. p. 548. ^ The Slave Trade: The Story of the Atlantic Slave Trade, 1440–1870 by Hugh Thomas. 1997: Simon and Schuster. p. 549. ^ Saving New Orleans Archived 2012年5月30日, at Archive.is, Smithsonian magazine, August 2006. Retrieved 2010-02-16. ^ Rivet, Ryan (Summer 2008). Petroleum Dynamite. Tulane University. pp. 20–27. 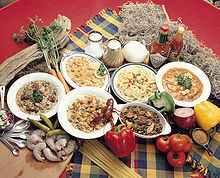 http://digital.olivesoftware.com/Olive/ODE/Tulanian/ 2009年9月7日閲覧。. ^ Keddy, Paul (2010). Wetland Ecology: Principles and Conservation. Cambridge: Cambridge University Press. ISBN 978-0-521-51940-3. ^ Boesch, D. F., Josselyn, M. N., Mehta, A. J., Morris, J. T., Nuttle, W. K., Simenstad, C. A., and Swift, D. P. J. (1994). Scientific assessment of coastal wetland loss, restoration and management in Louisiana. Journal of Coastal Research, Special Issue No. 20. ^ a b c d e Keddy, Paul A. (2008). Water, Earth, Fire: Louisiana’s Natural Heritage. Philadelphia: Xlibris. ISBN 978-1-4363-6234-4. ^ Coleman, J. M., Roberts, H. H., and Stone, G. W. (1998). Mississippi River Delta: an overview. Journal of Coastal Research, 14, 698–716. ^ Holland, W.C. 1944. Physiographic divisions of the Quarternary lowlands of Louisiana. Proceedings of the Louisiana Academy of Sciences VIII: 10-24. 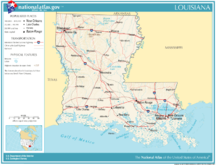 ^ "Louisiana's already-declining seafood industry could be wiped out". MiamiHerald.com. May 15, 2010. ^ Economy Archived 2013年10月12日, at the Wayback Machine. ^ "State Unemployment Trends by Race, Ethnicity and Gender" (PDF). 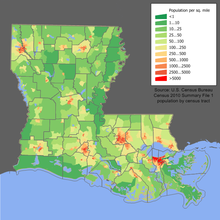 ^ "Despite BP oil spill, Louisiana still loves Big Oil". CSMonitor.com. May 24, 2010. The official works of Albert Phelps and Grace King and the publications of the Louisiana Historical Society and several works on the history of New Orleans, among them those by Henry Rightor and John Smith Kendall provide background.